On average, the health cover people take is between ₹ 1 lakh and ₹ 3 lakh. For minor hospitalization or surgery, this amount may be sufficient but what if there’s something serious? A massive heart attack can cost up to ₹ 5 lakh and a serious accident can burn a huge hole in your pocket. Therefore, as health costs soar, you need to review your health insurance needs and cover any shortfall. When increasing cover, consider top-up health insurance plans. They are cheaper alternatives to regular health insurance policies. Top-up plans start with a basic deductible of ₹ 1 lakh; the deductible can go up to ₹ 5 lakh (see table). A deductible of ₹ 1 lakh means the first ₹ 1 lakh of the hospitalization bill will have to be borne by the insured himself; the balance will be paid by the insurer. Owing to the deductible, these plans are cheap. This is because the insurer can protect himself from minor hospitalization claims, which can be frequent or highly probable. Sample Bajaj Allianz General Insurance Co. Ltd’s Extra Care, a top-up health insurance policy. For a sum insured of ₹ 10 lakh and a deductible of ₹ 3 lakh, the policy charges ₹ 2,500 from a 30-year-old. But for Health Guard, their regular indemnity policy, the premium is ₹ 10,913 for a sum assured of ₹ 10 lakh. Says Mahavir Chopra, head (e-business and retail), Medimanage.com, a health insurance portal: “With year-on-year healthcare inflation at 16-20%, a top-up policy is a low-cost investment, which will pay great dividends in the long run." Top-up policies come as individual and floater plans. A floater plan covers more than one individual in a family and considers the number of people covered as one unit. So if one member of the family invokes the cover, the sum insured reduces by that much on the rest of the family for that year. Limitations: Some top-up plans may not cover pre- and post-hospitalization expenses. For instance, ICICI Lombard General Insurance Co. Ltd’s Healthcare Plus and Star’s Super Surplus do not cover pre- and post-hospitalization expenses. However, Sanjay Datta, head-underwriting and claims, ICICI Lombard General Insurance, says there is a reason why. “Pre- and post-hospitalization expenses are roughly about 10-15% of the total expenses. This the base policy can cover. The idea behind a top-up cover is to not duplicate the health insurance cover but buy extra," he says. Also, top-up plans cover only “single incidence hospitalization". In other words, if your hospital bill exceeds the deductible during a single incident of hospitalization, only then does the top-up plan gets triggered. For example, if a person gets hospitalized and needs to cough up ₹ 5 lakh, a basic top-up plan of ₹ 3 lakh deductible will cover the difference of ₹ 2 lakh. But in a year, if he gets hospitalized twice and the first time it costs him ₹ 2.5 lakh and ₹ 2 lakh the second time, or in the case of a floater plan where two members get hospitalized with individual bills of ₹ 2.5 lakh each, the top-up plan will not get triggered at all. Even as collectively the bill overshoots the limit of ₹ 3 lakh, individually they are well within the deductible limit. When do they make sense? Top-up plans make a lot of sense if you have a comfortable base. Says Chopra: “Top-ups are being mis-sold as an immediate extension cover of an existing cover. But the most important factor that people are unaware of is that the threshold or deductible triggers only when the cost of single hospitalization goes above the threshold. Hence, in our opinion, one should have a comfortable core cover for the family and a top-up to extend the cover." In fact, top covers are cost effective the most when the deductible is high. You can afford a higher deductible when your basic cover is decent. 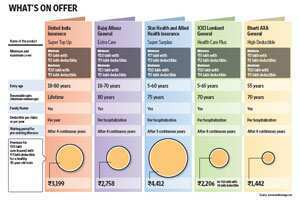 Sample this: For a deductible of ₹ 2 lakh and a top-up cover of ₹ 5 lakh, a 35-year-old will need to pay ₹ 4,412. Increase the deductible to ₹ 4 lakh and the top-up cover to ₹ 10 lakh and the premium actually comes down to ₹ 2,206. So in the first case, if the person had a regular health insurance policy of ₹ 2 lakh, he would have to shell out ₹ 10,289 for both the plans for a cover of ₹ 7 lakh. In the latter case, the collective cover of ₹ 14 lakh would come for ₹ 11,977, ₹ 7 lakh worth of extra cover would come for ₹ 689 more. Explains Datta: “The premiums actually depend on how close you are to the ground. Typically, minor claims that are between ₹ 2 lakh and ₹ 3 lakh are more frequent than huge claims that are above ₹ 4 lakh. So a top-up plan that comes with a higher deductible is cheaper than a top-up plan with a lower deductible." Floater policies: A good time to consider a floater policy is when your family expands. Since a floater policy considers the entire family as one unit, the premiums are lower. But the biggest advantage of a floater policy is also its biggest drawback—in the rare case when the entire family needs medical care, a small floater cover can pinch very hard. Says Chopra: “We recommend floater policies over multiple individual policies because administratively floater policies are easier to handle. However, a person needs to ensure that he has ample cover under his floater policy. For a family of four, a cover of ₹ 10 lakh is advisable." Defined benefit plans: The market does not stop at indemnity policies alone. Health insurance plans that have a defined benefit are equally popular. Since the benefits under these plans are defined, they usually work well as income supplement products. For instance, a critical illness plan gives a predefined lump sum if the policyholder is diagnosed with a specified critical illness. The policy terminates after this. The idea behind a lump sum is to compensate for the loss of income due to a critical illness. But if you have enough savings or sufficient health insurance, you could give other defined benefit plans, including hospital cash that pays daily cash during hospitalization or major surgical benefit that pays a lump sum on major surgical procedures a miss. To make top-up plans work in your favour, ensure you have a comfortable base. In assessing your base, don’t just bank on the health insurance policy provided by your employer. If you switch jobs, you will lose that. Also, with portability becoming a reality, if you are a healthy individual, you can consider porting your employer’s policy to an individual one when changing jobs.